*Congrats to Laura of Bits Of Sweetness! On the hunt for that perfect one of a kind gift this season? 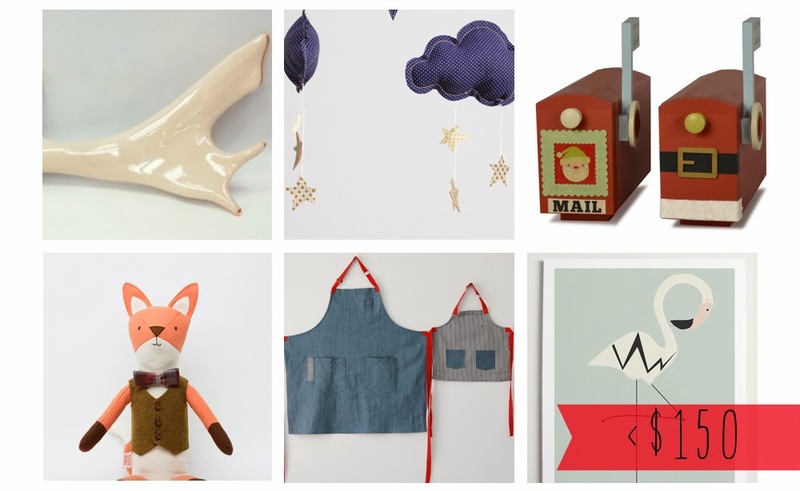 Look no further then BRIKA - A one stop shop that features some of the most fabulous makers and handicrafts on the market today. A unique online shopping destination that offers a curated selection of special pieces that are destined to become heirlooms and celebrates the makers behind them. Shop for everyone on your list! I think we can all agree that shopping for a baby at Christmas can be a tough, do we buy them a gift? Will they care? Do we get something they need or can grow into later in the year? My advice is to do a little of both - I always have fun selecting things that are useful and then some memory makers too (then I package it in a fun box because that's the only part they really care about). 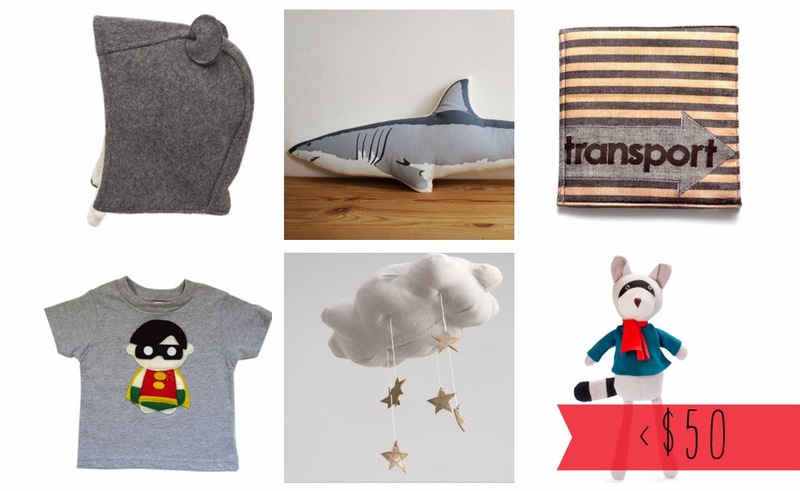 I am also all about budgets and minimizing this year so I came up with three gift guides for you in three great price points! I tried to do a good blend of wants, needs, and fun surprises. These are all Robin and mommy approved . I had so much curating this gift guide for Robin - I could digitally thumb though BRIKA's stock all day! Hats! I can't get enough of hats for my little man. If it has ears? It's coming home with me, just like this Souris Bonnet by Patouche. We recently purchased Robin the shark bedding from Pottery Barn, this Broder Press shark pillow would compliment it perfectly. Robin is tough on books but sure loves his cars and trucks, what a great stocking stuffer one of these cloth books by Ex Libris Handmade would make. I mean, this Robin shirt, how could I not? I have had my eyes on a Baby Jives mobile since I very first discovered them on Instagram. This one would the perfect addition to the house frame floor bed that Tim built. Last but not least, I always love to top the kids stocking off with a new stuffed friend and I couldn't turn down this guy and his cute scarf by Hazel Village. So in love with this Wooden Moose by Enormous Champion, Robin loves to walk his animals all over the carpet and even gives them voices! I was stunned when I saw this pillow - There are few truer words that I would like my son to live by. This whale mobile by Petit Collage would be the perfect addition to the kids adjacent whale themed bathroom. A whimsical decoration to look at during bath time! I have been a long time lover of Zuzii Footwear and these Olli Cashmere Boots and Camel Suede Mox give me heart eyes for days. What a fun way to discover geography! Robin and the girls would spend hours standing around this gorgeous World Map Decal by Petite Collage. 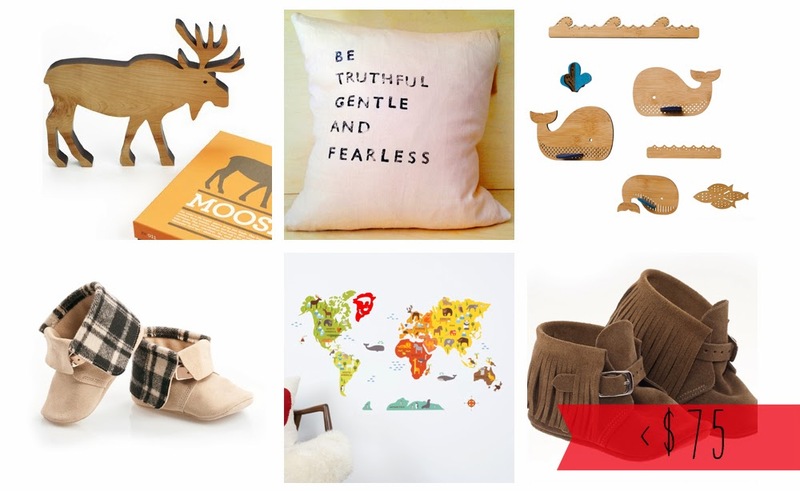 I have been on the hunt for the perfect antler addition to Robin's room - I think I found it! How amazing would this Fallow Deer Antler by Honeycomb Studio look on top of his DIY striped dresser? Of course I added another Baby Jive mobile in this list! I love the contrast and depth of the Navy + Stars Cloud Mobile. Yes! Yes! Yes! Robin and the girls would flip for these adorable Santa Mailboxes by Tree by Kerri Lee. The perfect opportunity to send of their many request while saving mama lots of trips to the fake post office. Henry the Fox by Walnut Animal Society has always had a warm place in my heart. I can just see him now poking out of Robin's stocking on Christmas morning. Just look at his bow tie! The girls have their frilly aprons for helping me in the kitchen. Now it is Robin's turn - He would love these Joy + Ruby toddler aprons by Hedley and Bennett. I love art that is different and makes a statement for Robin's room. This Flamingo Print by Modern Pop would fit right in with his squirrel house he already has up. So, what do you think? Did you see anything to pencil onto your little ones list? I can't wait to do some more shopping with BRIKA. I encourage you to sign up with the BRIKA community and then like BRIKA on Facebook so you can be among the first to know about new makers as they’re announced! You can also follow on twitter, Pinterest and instagram for the latest crafts and happenings. That's not all! Brika wants to give one of my readers a $25 credit to shop at Brika. What gift from BRIKA would you love to give and who would receive it? Your mother? Your Best friend? Or one of your little ones? To enter please visit BRIKA and sign up with the BRIKA community. Take a look around and then come back and share the url of something you would like to give (or receive) this holiday season. You won't want to miss this giveaway, I promise! Disclosure: This post was sponsored by BRIKA but the content and opinions expressed here are all my own. I did receive compensation for my time and work on these gift guides. Oh my goodness! SO much cuteness! P.S. Those moccasins are really adorable!! Love this and everything there! So much gorgeous stuff.